Battlefield V Tides of War Chapter 2, Lightning Strikes, will release on Thursday the 17th January, EA has confirmed. Lasting for “several weeks”, Lightning Strikes brings with it a host of new challenges, maps, game modes, progression options, and gear. Headlining the early stages of Chapter 2 is a more intense version of the game’s most popular mode, Squad Conquest. Playable on the Arras, Hamada, and Rotterdam maps between the 17-30th January, this version of Squad Conquest supports up to 16 players (split into two teams of 8). As this might suggest, matches are more tactical, tense, and intimate affairs, featuring a number of supplementary rules that drastically alter the ebb and flow of matches. These include restricting respawns to HQ, limiting access to vehicles, and reducing the number of available capture points. 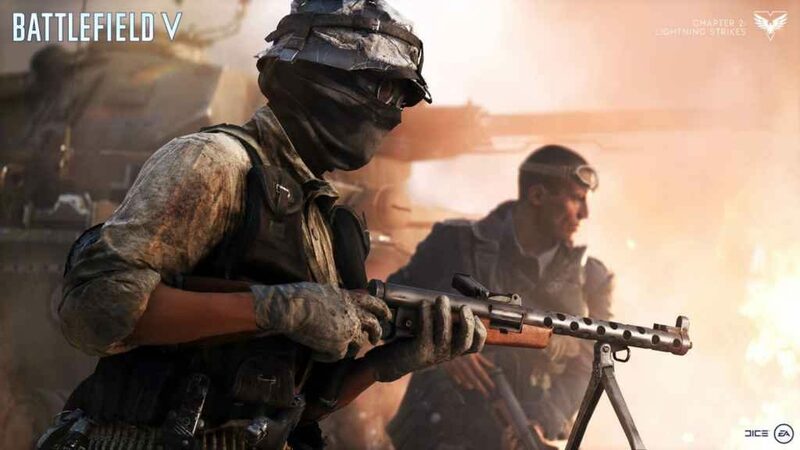 A comprehensive breakdown of the new mode can be found on the BFV website. In terms of content, Battlefield V Tides of War Chapter 2 is chock full of brand-new weapons, vehicle skins, and challenges. Each of which available to anyone who has the time and patience to make their way through all 40 ranks of progression. We won’t endeavour to list them all, but highlights include the Lightning Strikes Emblem, seven new Special Assignments, The Gambler Allied Soldier Set, and the M1922 White Tiger weapon skin. Even more exclusive items are also up for grabs, should you wish to attempt any of the various Chapter Events scheduled throughout Lightning Strikes. The very first of which kicks-off on the 17th January. Again, we’ve got a link to the official website if you fancy taking a look at everything Chapter 2 has on offer. Lightning Strikes isn’t all about unlocking new gear, of course. EA will also be implementing a number of gameplay alterations and bug fixes over the course of Chapter 2; many in response to community feedback. These cover everything from weapon and vehicle balancing, to audio-visual and UI issues. The most significant, however, focus on the game’s post-death experience. The death experience has improved with the addition of a camera that now follows and zooms towards the killer. Finally, there’s just time to mention that, along with everything recorded above, DICE plans to introduce even more supplementary content as Chapter 2 progresses. This includes a brand-new Grand Operation and the return of Rush at some point over the next few weeks. Considering the relative paucity of launch day content, it’s good to see EA delivering on its promise to provide new Battlefield V experiences and expand what is, at its core, a fantastic first-person shooter.